One of the best ways to reduce your feed costs and increase revenue in your livestock operation is to optimize the utilization of forage in your pasture. 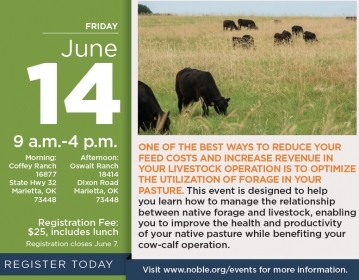 This event is designed to help you learn how to manage the relationship between native forage and livestock, enabling you to improve the health and productivity of your native pasture while benefiting your cow-calf operation. At this workshop, you will learn firsthand how to estimate native forage quality and quantity and how to use this to best meet your herd’s nutritional needs. We will also explain and demonstrate the benefits of tools, such as grazing exclosures, prescribed fire and forage testing.